Before we begin, please note that in all my postings, if you find capital letters in the middle or end of a word, you need to pronounce it as follows: A as the a in army, E as the ya in Yale, I as the ee in tree, L as the l in glucose, N as the n in Andy, O as the o in orient and U as the too in tool. If zh is used, it is pronounced as the Ja in Jane in French. In any full meal plan, staple food is very essential. It may be rice, wheat or even potato as in Ireland! Being an Indian from the southern part, I would like to begin my posting with rice. There are different varieties of rice and we use them for different purposes. Some use raw rice and some boiled rice. It is said that the boiled rice is good for health and even diabetics can use it. Further, you cannot find worms or beetles infesting this type of rice. Those who are habituated to eat raw rice can find par boiled rice having the same taste and consistency. 01. Whether it is raw or boiled rice, just crush a few grains between your teeth. If they are very hard you need more water and if easy to crush, you need less water. Further the colour of raw/new rice is pure white which applies even to new boiled rice. In the case of old raw or boiled rice, the colour is pale white to yellow. 02. For Pongal, the rice should be cooked very well to the consistency of paste. Then only it will taste nice. That is why normally we use new raw rice for this purpose. 03. When you buy rice, ensure that it is not meant for the purpose of flour but for cooking purpose only. For snacks, i.e., sweets and savouries, you need rice meant for the purpose of flour. Normally it is raw rice. For fryums (VadAm as known in the south) also we need flour ground from raw rice. 04. For pulAv and mixed rice as well as where you use rice with powders (i.e. Podi as known in the south), prefer long thin and old rice. 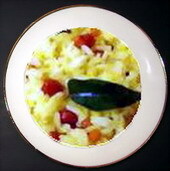 Basmati rice is good for pulAv as it renders a distinct flavour. 05. For idlis and dosAs, we use both raw as well as boiled rice but the measurements differ when we use them with the black gram dAl. 06. It is suggested by some that if we soak the rice for a few minutes and then cook, it not only cooks well but also consumes less gas. Though I have not tried this, I gather that after washing the rice well and draining, you need to soak it for 10 minutes and for a cup of new rice you need to add 1 and ½ cup water while for the same quantity of old rice 2 cups of water. Also, the former requires two whistles while the latter 3. If after this, the rice is not cooked well, you need to keep it in the pressure cooker for another 5 minutes under low flame. I also understand that the rice cooked in this manner does not become paste but each grain is distinctly separate. 07. If you use normal pressure cooker, ensure that the gasket is placed properly and steam does not escape too much than required. Do not forget to place the weight. Ensure that the safety valve is in tact and that you have closed the lid properly. It is also essential to maintain proper water level both inside the vessel and outside it. Generally, after the rice is washed well and put in a vessel for cooking, we add water in such a way as to keep the water level just 1 inch above new rice and 1½ inch for old rice if you do not know the measurement. However, by trial and error only you can learn the exact quantity need for a particular variety of rice. 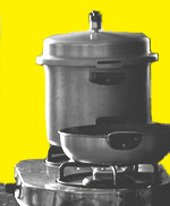 Thus, try the water level as suggested and increase or decrease as the case may be after seeing how the rice is cooked. 08. If you use electric rice cooker, the instructions are given by the manufacturers. Normally, we add for every cup of old rice 1½ cup of water and for new rice 1 cup. Here too you need to fix the exact quantity of water after trial and error method. In some cookers, there are extra adjustments for types of rice which you must not forget to set before switching on the cooker! 09. If you microwave the rice, then use a bigger micro proof vessel so that water does not spill out. This applies to direct cooking too. Here also, very old rice needs more water than new rice. 10. I have also seen some people adding a teaspoon of cooking oil or 1/4th teaspoon of lemon juice to the hot cooked rice just taken out of the cooker and mix gently without breaking the grains so as to separate each cooked grain from becoming paste later. They say that the lemon juice makes the appearance whiter. I am going to narrate here my experience acquired in my first initiation into the Culinary World at the age of 12. I was asked to cook rice since my mother was not feeling well. In those days there was no pressure cooker or gas stove. 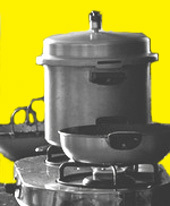 Earthen stoves called ChUlAs were in use. A bronze pot named “Vengala PAnai” was used to cook rice. After the rice was done, the pot with a perforated plate called “Chippal thattu” on it was tilted gently and rested on a raised platform in a slanting position to allow the excess water to drain out. I had been watching my mother doing the process daily and it looked so easy to me. But when it came to my turn, I realised the intricacies involved. When I was about to turn the pot on to the platform the cloth with which I was holding the pot with plate was so hot that I lost my grip. The pot rolled and the rice fell on my hands. Hearing me screaming, my mom came running to see what had happened. She applied some cream to the burns and taught me the future precautions to be taken. Since I was young, the incident didn’t matter me very much. But, when I go back with my nostalgic memories, I really pity our ancestors for not having the amenities that we have today. Thanks to those who have brought these changes to make life easier. Even today, it is necessary for moms to train their children with “Don’ts” and “Do’s” in respect of the cooking gas, cookers and other appliances used in the kitchen to avoid mishaps stressing the key points. You can get the tips on the net for each of these. This entry was posted on February 3, 2011 at 10:28 pm and is filed under cooking oil, dAl, Introduction, On rice, On wheat, tamarind with tags boiled rice, cooker, raw rice. You can follow any responses to this entry through the RSS 2.0 feed. Both comments and pings are currently closed. Thanks a lot! I am glad that you could find one of the tips to be useful and I would be too glad if the postings in this blog are one way or the other useful to everyone!! I intend to sprinkle a few nostalgias at appropriate place to enable my readers to avoid the errors I made!! !